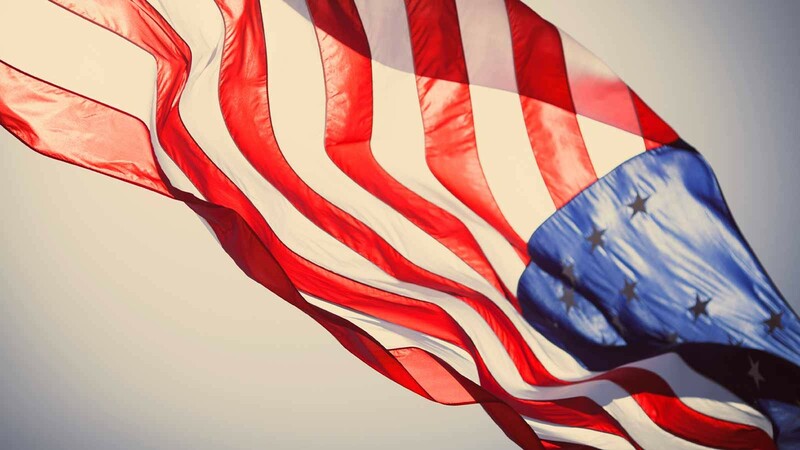 America is home to so many world famous sporting events and the J1 is the perfect opportunity to experience some of these. So what kind of events can you get to experience I hear you ask? The most likely sport you’ll encounter is baseball as this runs throughout the summer with games on practically every night of the week. As luck would have it, Chicago is home to 2 baseball teams; the White Sox and the Cubs. These two teams are currently experiencing some contrasting fortunes with the Cubs near the top of the league following their incredible 2016 World Series Win, while the White Sox are going through a poor patch. 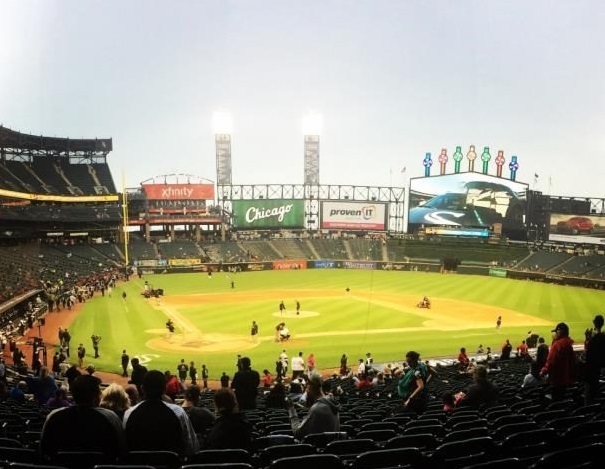 Don’t let this sway you though as due to their poor form, the White Sox offer pretty cheap tickets and some great promotions ($1 hot dog Wednesdays being my favourite). On top of this, the White Sox play in the ultra-modern Guaranteed Rate Field which means there’s not a bad seat in the house. I went to several White Sox games throughout the summer, as not only were they cheap but the stadium was also very close to where I worked. Having said this, after spending some time in Chicago it becomes quite clear that the Cubs are Chicago’s team. Walking around the city on game days, the buzz was palpable and the number of people wearing jerseys was a sight to behold. Playing in the historic Wrigley Field, the Cubs attract close to sell-out crowds of 40,000 to the majority of the games. While this makes tickets more expensive, it was definitely something I was keen to go to and we eventually managed to get tickets to a Thursday afternoon game. The atmosphere was electric and almost like an All Ireland Final! As the game progressed, it was looking like it wasn’t going to be the Cubs' day as they were trailing by 2 runs in their final innings (how knowledgeable do I sound with all this lingo eh). Then cue the craziness… David Bote hits a home run to bring 2 home and level the game. Next, up steps Anthony Rizzo who hits it out of the park and the Cubs win!! The crowd goes wild!!! To explain, this was similar to scoring an injury time goal to win a game… impressive or what?! Ice hockey tends to have its 7 game finale- known as the Stanley Cup- during the last week of May so it might not be possible to see it in the flesh, but it is pretty cool to watch in a bar while settling into your new city. Ice hockey can be a very physical sport and it is facinating to watch the big hits fly in. American Football is typically only getting started in August and this means that some pre-season games may be on near you. 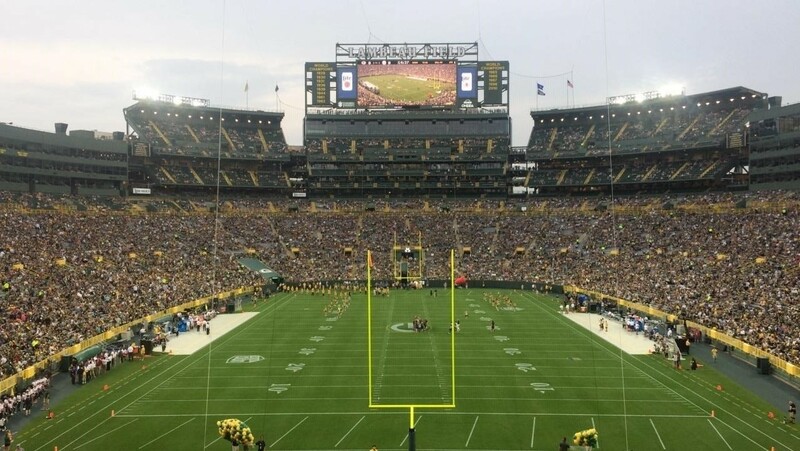 One of the guys in our house was a Green Bay Packers fan and when we saw that they were playing a home game against the Pittsburgh Steelers a mere 3 hour’s drive away it was road trip time. A Green Bay resident described the town to me as a drinking town (given the number of breweries there) with a footballing problem and having been I can see why. Although this was just a pre-season game, it attracted a near capacity crowd of 80,000 and the buzz was brilliant. Even driving up to the stadium, nearly every house had people outside it waving flags offering parking. Inside the stadium, it was much the same, with all the razzmatazz you’d expect of an American sporting event. Afterwards, spending the night in an American sports bar where we were the only Irish was a welcome change from the typical J1 nights. Besides Wrigley Field, the other famous sporting venue in Chicago is of course Soldier Field. 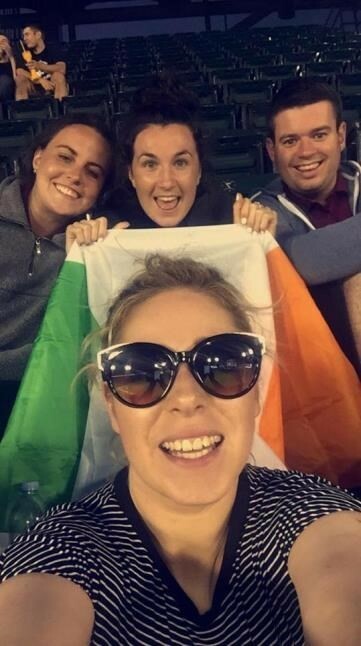 While it is most famous for being the home ground of the Chicago Bears, Irish people will probably remember it as the stadium where we finally beat the All Blacks! 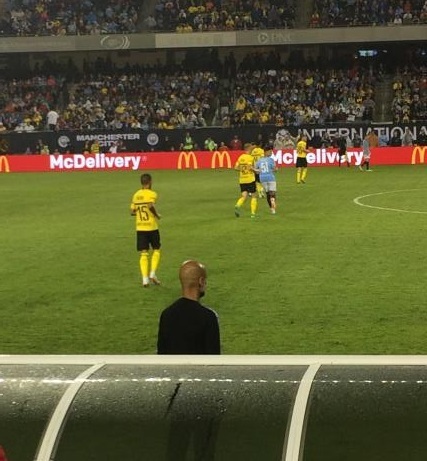 The summer we were in Chicago, Soldier Field played host to the Manchester City vs Borussia Dortmund soccer match in the International Champions Cup (a glorified pre-season game, let’s be honest). The decision to go to this was rather last minute but we ended up with pretty decent seats behind the goal. After the game had started we realised there was plenty of empty seats and at half-time we moved to some new seats in the second row, practically on the half way line and right behind Pep Guardiola! While you may be on the other side of the world, don’t forget that the GAA is quite prominent in America during the summer. Each major city tends to run its own championship and seeing a match is a great way to meet new people and ease the homesickness. An alternative way of doing this is by popping down to your local Irish bar on weekend mornings to catch the Sunday Game. You’d be surprised who you’ll bump into (Diarmuid Connolly in our case) or become friends with. As you’ve probably guessed by this stage, I am quite into sport and when I saw that a PGA event (golf) was on just outside Chicago I suggested we rent a car and go for the day. The John Deere Classic took place near Quad City, which is about 3 hour drive from Chicago. Unfortunately for us Kilkenny fans- the day we were both off, Sunday, coincided with the All-Ireland Quarter Final against Limerick. Nonetheless, we threw on our jerseys and headed off, streaming the match on GAAGO as we went. As I’m sure you know by now, Kilkenny were beaten so not the best start to the day. When we got to the PGA event, we noticed that Seamus Power from Waterford was doing fairly well and we decided we’d follow him as he started his round. 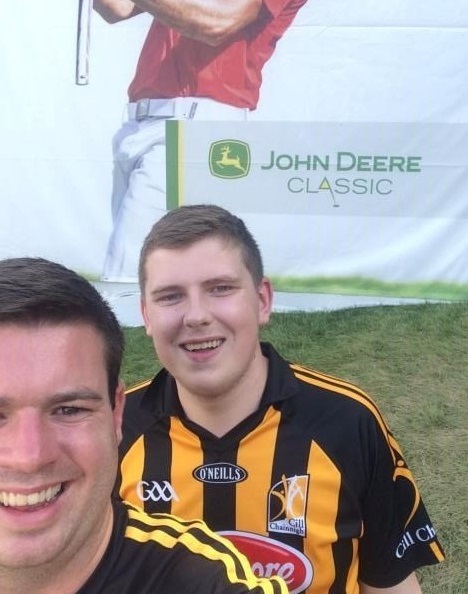 As we sat at the first tee waiting for him to tee off, he instantly recognises the Kilkenny jerseys and gives us a big friendly wave… day made. We watched Seamus throughout the day, slipping away every now and again for refreshments and a break from the scorching heat. After the 18th hole, we managed to have a quick chat with Seamus where of course he managed to get in a sly dig about us losing the hurling (ironic coming from a Waterford man eh?). Our travelling at the end of the summer brought us to New York City and we decided on our last night we’d go see a Yankees game. The day we were there, they were playing the Chicago White Sox! I swear this was not planned at all. Yankee Stadium is one of the newest stadiums in the MLB, having only been built in 2009, and spending the night watching the White Sox was the perfect way to end a summer of sport in Chicago. Keep an eye on ticketmaster or stubhub for games near you. Look out for promotion nights such as $1 hot dogs or free hats. An Irish flag or jersey never goes astray at any of these events! Food/ drink can be expensive inside stadiums so it might be an idea to have some before you go. Read more blogs: Julianne's San Diego J1 Experience, Mike's J1 Summer In Chicago, Rebecca's New York J1 Experience, Cara's Ocean City J1 Summer, 5 Tips For Making The Most Of Your J1 Experience, How To Source Your Own J1 Job.